- WCCW 5th Cotton Bowl Extravaganza (October '88) = The Samoan Swat Team (Fatu & Samu) lost the WCCW Tag-Team Titles to Michael Hayes & Steve Cox in a "Texas Tornado" match. - AWA Superclash III (December 13, '88) = The Samoan Swat Team defeated Michael Hayes & Steve Cox to retain the WCCW Tag-Team Titles. - NWA Clash of the Champions VI (April 2, '89) = The Samoan Swat Team won over the Midnight Express. - NWA WrestleWar '89 (May 7) = The Samoan Swat Team was taken down by the Dynamic Dudes. - NWA World Tag-Team Title Tournament (May/June '89) = The Samoan Swat Team won over Ranger Ross & Ron Simmons, then were beaten by the Midnight Express. The Fabulous Freebirds won the tournament. - NWA Clash of the Champions VII (June 14, '89) = The Samoan Swat Team fell to the Midnight Express. - NWA Great American Bash '89 (July 23) = The Samoan Swat Team & the Fabulous Freebirds were beaten by Steve Williams, the Road Warriors, & the Midnight Express. - NWA Clash of the Champions VIII (September 12, '89) = The Samoan Swat Team was defeated by the Road Warriors. - NWA Halloween Havoc '89 (October 28) = The Samoan Swat Team (Fatu, Samu, & Samoan Savage) won over Steve Williams & the Midnight Express. - UWA 16th Anniversary Show (January 27, '91) = The Samoan Swat Team Fatu & Samu) & Kokina lost to Dos Caras, El Canek, & Mil Mascaras. 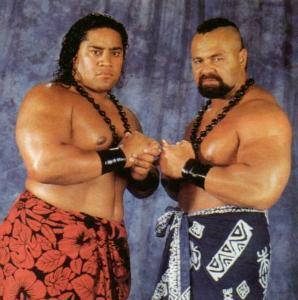 - WWF Survivor Series '92 (November 25) = The Headshrinkers (Fatu & Samu) defeated High Energy. - WWF Royal Rumble '93 (January 24) = The Headshrinkers competed in the Rumble, which was won by Yokozuna. - WWF Wrestlemania IX (April 4, '93) = The Headshrinkers were beaten by the Steiner Brothers. - WWF King of the Ring '93 (June 13) = The Headshrinkers & Money Inc fell to the Smoking Gunns & the Steiner Brothers. - WWF Summerslam '93 (August 30) = The Headshrinkers & Bam Bam Bigelow were beaten by Tatanka & the Smoking Gunns. - WWF Survivor Series '93 (November 24) = The Headshrinkers, Bam Bam Bigelow, & Bastion Booger lost an Elimination Match to the Bushwhackers & Men On A Mission. - WWF Royal Rumble '94 (January 22) = The Headshrinkers competed in the Rumble, which was won by Lex Luger & Bret Hart. - WWF King of the Ring '94 (June 16) = The Headshrinkers retained the WWF Tag Titles, winning over Crush & Yokozuna. - WWF Summerslam '94 (August 29) = The Headshrinkers lost, via DQ, to Irwin R. Schyster & Bam Bam Bigelow. - WWF Survivor Series '94 = The Headshrinkers (Fatu & Sionne), Razor Ramon, Davey Boy Smith & the 1-2-3 Kid won an "Elimination" match over Diesel, Shawn Michaels, Owen Hart, Jeff Jarrett & Jim Neidhart. 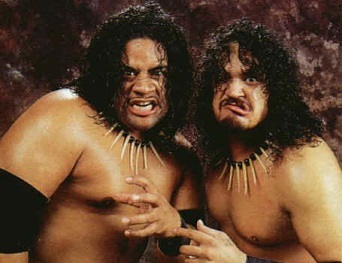 - WWF World Tag-Team Title Tournament (December/January '95) = The Headshrinkers (Fatu & Sionne) defeated the New Foundation, then lost to Tatanka & Bam Bam Bigelow. Bob Holly & the 1-2-3 Kid won the tournament. - Heroes of Wrestling (October 10, '99) = The Headshrinkers (Samu & Samoan Savage) defeated Marty Jannetty & Tommy Rogers.